Roland Gissing was born in Willersey in the county of Worcester, England on 14 May 1895. The artistic side of his nature came from his father Algernon Gissing, a well known novelist, who was the brother of the quite famous writer, George Gissing. With the exception of a few years art instruction at George Watson’s College in Edinburgh during the early 1900’s, Gissing is almost entirely self taught. Introduced to the phenomenon of the “moving picture” while in Edinburgh, he made visual contact with the freedom of the western frontier and the world of the cowboy. The west became the country of his dreams. Arriving in Calgary, Alberta in the spring of 1913 an 18 year old Gissing came to Canada and for more or less the next ten years followed the life of a cowboy, taking life as it came, from the Peace River country as far south as Mexico working on various ranches along the way. 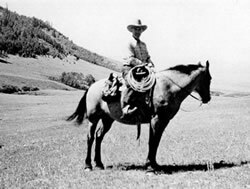 While in Montana Gissing met Charlie Russell the famous cowboy artist who nodded approval of Gissing’s early sketches depicting life on the range. In Nevada he met Will James, the cowboy writer of western stories who also gave Gissing considerable encouragement. It was the fall of 1923 that he was fortunate enough to find an open homestead on the east bank of the Ghost River west of Cochrane, Alberta. The beauty of the foothills and Rockies decided the location for him and a fortunate one it was. His fondness for sketching and drawing had grown and with a rising need to test his ability he wanted to try painting for a living. And so it was that Roland Gissing would become one of Western Canada’s most prolific artists until his passing in September, 1967. His realistic portrayal of the western landscape is today prized and honoured by many. "I am proud to say that I knew Roland Gissing, not extremely well but well enough to leave me murmuring to myself: He was my kind of an artist; I wish I had known him better. There have been few Western Canadian painters whose works have become more familiar to laymen connoisseurs. The notable popularity of Gissing art speaks for itself. The clarity and colourful form in his paintings conveyed a direct and simple view of the land, sufficient to broaden and enrich the Canadian concept of heritage. Roland Gissing was very much like his paintings. A man of simple tastes who said little but accomplished much, he resolutely pursued a long held dream of painting his adopted land. He wanted to bring his love of the outdoors to others just as he saw it, and he succeeded so completely and profusely that to many people in the years before color photography, a Gissing scene was synonymous with the Western Canadian landscape." Described as a generous soul and a good man, to many Roland Gissing was the man in the plaid shirt with the kindly eyes and the perpetual cigarette who looked more like a rancher than a successful artist. His strength of character was admired. The shy and quiet demeanour hid a sensitive and tranquil soul, a man who was very easy to be around. Gissing was a lover of nature, a gentle romantic and a shrewd business man who thrived on challenge and work. His total identification with the west, both through his work and in his personal embodiment of characteristics associated with the western frontier spirit validates his self proclaimed love of the land. He had always been fascinated with the vastness of the west, but only came to grips with it in his painting towards the end of his life. Probably more than any other artist, Gissing’s work publicized to the world the beauties of the streams, woods, hills and mountains of the ranching areas of Alberta. Gissing’s work can be found in galleries and private homes through out the world. Many of his paintings were special presentations commissioned by civic and provincial organizations as gifts to notable visitors including Queen Elizabeth and Prince Phillip. It was recognized many long years ago that a painting by Gissing was not only something unique that would be prized highly by the recipient, but was a correct and warm portrayal of the Alberta landscape. In early 1924, the twenty-eight year old Gissing constructed his first cabin on the beautiful Ghost River near the junction of the Bow River forty miles west of Calgary, Alberta. It was here the artistic talents truly began to unfold. His neighbour was Captain Malcolm Mortimer on the old Ghost Ranch and he influenced Gissing to take up painting seriously. Mortimer’s encouragement was substantial for he bought several sketches. The Mortimer family had acquired an easel and brushes used by Lionel Barrymore, who was a good artist besides actor. Gissing used the easel until 1944 when tragedy struck. A fire destroyed his home, studio full of paintings, sketches and a large library. Not to be discouraged, a new home was built and painting commenced again with renewed vigour. Working mainly with pastels and watercolour, Gissing didn’t evolve to oils until 1930 and spent the next three years experimenting with this medium. This was a critical period for Gissing in that it marked a transformation in his painting style, a style that was to become his trademark. 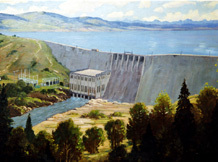 From 1935-1944 Roland Gissing made a prominent name for himself as one of western Canada’s most successful landscape artists. He remained at the Ghost until the property was sold in 1955. Gissings creativity had its greatest expression in his model train hobby. Not content with buying models and accessories he built his own railroad from scratch. Drafting his own blueprints and creating his own lathe he began building live steam- powered locomotives, cabooses and passenger cars with associated track running from his shed out to a circular track. The resulting Ghost River Railroad became an attraction for the many regular visitors and curiosity seekers. When Gissing built his new homestead near Okotoks, Alberta his passion for trains continued. An outdoor track took shape with the addition of an electric model in the basement. Gissing’s work coincided with a vibrant period in Calgary’s and Alberta’s history. With substantial oil reserves discovered in Leduc in February of 1947 Alberta was thrust into the forefront of a vibrant international industry. As dozens of exploration and related oil companies set up headquarters, Calgary became home to hundreds of new arrivals. 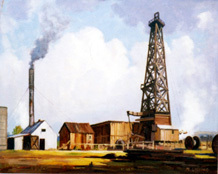 The affluent senior executives forming the emerging “oil patch” bought their Gissings by the score with several hundred estimated to be hanging in homes across the United States. His series on the History and Development of the Oil Industry in Alberta was completed and ready for exhibition in early 1951. Shown for the first time at the main branch of Calgary’s Bank of Commerce, the exhibition travelled to San Francisco for a Canada Week display continuing on to Seattle, Portland, Chicago and New York for further exhibition. Encouraged by Ernie Richardson, Manager of the Calgary Exhibition & Stampede in 1929, Roland Gissing showed his work for the first time, mainly pastel and watercolour, at the Calgary Public Library. By the early 1930's Gissing was working in oils capturing the beautiful landscapes west of Cochrane at the Ghost Dam where he made his home. It was 1934 when Gissing opened his first major exhibition of oils at the Calgary Exhibition & Stampede to critical acclaim. Further one man shows were held in 1947 and 1960. 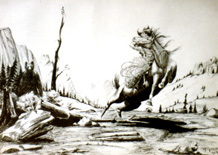 During 1953 Gissings painting was restricted mainly to the studio with the exception of the work he did on the Cochrane float for the Stampede Parade that year. The panels became part of the inventory of the Stockman’s Memorial Foundation and today hang in the dining room of the former Western Heritage Centre in Cochrane. 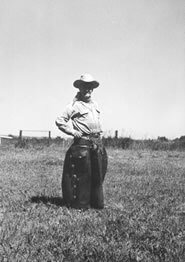 In 1957 Gissing bought 20 acres of beautiful rolling country near Okotoks south of Calgary. Most of his free time during that year was spent getting his new house planned and built. Building on his own and subcontracting when necessary, Gissing maintained involvement in all phases of construction. His pride and joy became his flower beds planned with an artist’s eye to colour, form and harmony. The passion for his beloved trains continued. Although not as ambitious as the Ghost River Railway, a model railway track took shape at the back of his house. He began experimenting with compressed air in place of steam to drive his locomotives. He became increasingly interested in electricity and began constructing a model electric train complex in his basement. He began to paint steadily with his focus changing from the confining mountains to the openness of distance and space. The first of many annual exhibitions at Gainsborough Galleries in Calgary opened in December 1959. On September 29, 1967 Gissing rose at his usual hour and spent the day painting in his studio. Following dinner with Ester at 5:00pm he went outside to begin some preliminary staking for a proposed scenic railway. His hammering and whistling told Ester all was well as she did the dishes. Shortly after 6:00pm she noticed the silence and went looking. Roland was found unconscious in the garden. Although the doctor arrived within 10 minutes it was too late, Roland Gissing had died.